Between close streets, the magnificent buildings on the West Lake, a village still exists with many cultural relics, ancient history. Visitors to Hanoi but not to the West Lake in Hanoi is not considered, because this is an ancient symbol of Hanoi, along with To river and Nung mountain. 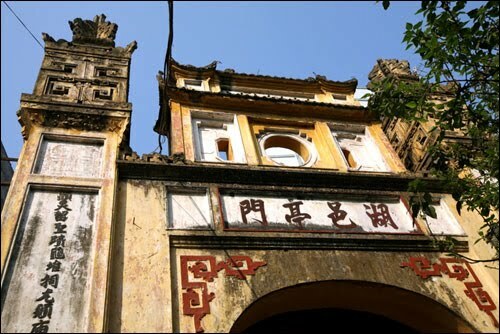 This is the center of Hanoi where old-full of myths about the chang waste land into cultivated areas West Lake, mining area Long Do and also presents many monuments temples, pagodas, temples, shrines the most in Thang Long. 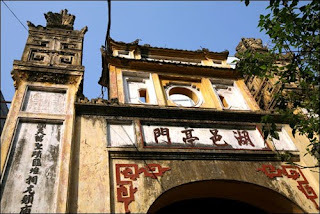 Ho Khau is a village located in the ancient land. The village is next door to the lake with To Lich river so called Ho Khau. 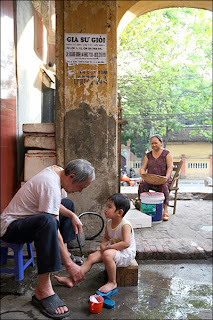 According “Ho Khau take notes”, the village is exploring from Hung Vuong period. To the Ly-Tran-Le, village administrative staff is located in Vinh Thuan district, the Phung Thien palace, Thang Long – now the third ward neighborhood Buoi ward, Tay Ho District, Hanoi. The beauty of the village system first in the village gates massive and monumental blocks connected together on a road length of about 300m. The middle three door temple gate was built architecture 4 pillars is based on the curved roof after roof tiles and fish scab. 2 columns between 45cm wide, 7m high. Above the 4 pillars bank Ranh Ranh fruit stylized flanking four sides. 4 side of pillars are located in parallel sentences. Door step built three step staircase, have large to rest step , both sides wait seat. Attached to three door temple gate on the left is the north entrance of the village. 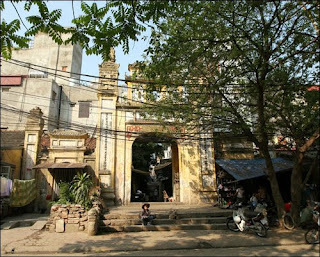 To the right is the entrance to the Chuc Thanh temple. Through the Ve Quoc temple entrance Giap Dong of village. 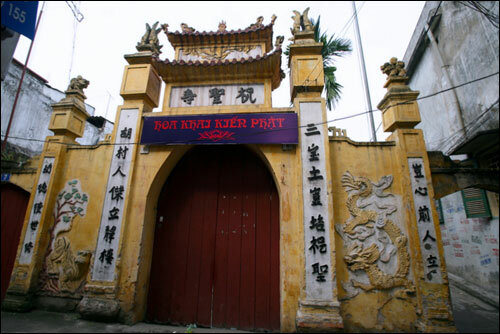 Gate system was a group of cultural heritage village unique in Thang Long. Home gate is Duc Thanh Mau Thuy Tinh Princess sanctuary, the daughter of Dong Dinh Vuong, the villagers still called “Dien Mau Thang Long”. Outside the village, apart “Dien Mau” aslo the “Giap Dong” temple worship Duc Thanh Em, temple known as the “Ve Quoc” temple. 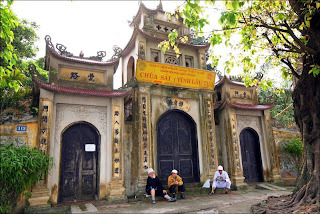 The village has three temples, two temples located outside the village and a temple built in Giap Bac, worship Duc Thanh Ca, called Duc Thanh temple. Two saints worshiped temple in Giap Bac and Giap Dong because of deserve well of country in the career defeat Tong and Nguyen invader. Besides they deserve well of setup village, water treatment should be Duc Thanh Hoang worshiped in communal house in the village. It was an old communal house located on the beyond of West Lake, then to the Nguyen dynasty moved in the village, located at the center of the village today. Communal house in the village has many worship objects and horizontal lacquer. 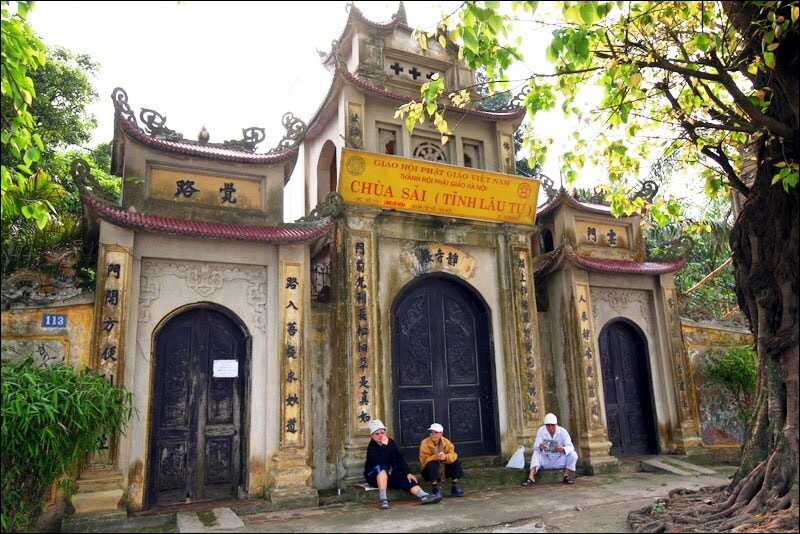 All three are natives build temples from the Ly dynasty was 3 certificate in years Vinh Thinh 6 (1711), Canh Hung 22 (1762), Canh Hung 44 (1784). Ve Quoc temple was ranked in 1995. Duc Thanh Temple was ranked in 2005. Village has 2 pagodas, legend will be starting up from the Ly, a stele scored big restoration in Canh Thinh VII (1799.) 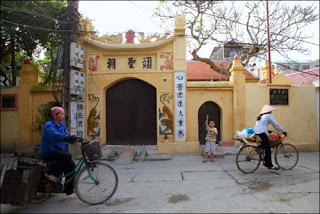 The pagoda is located in the village of Chuc Thanh, the pagoda establish of West lake known as Tinh Lau or Sai pagoda. This is an ancient monument built on a large campus of 3 hectare, there are many ancient trees that state were ranked classified national in 1995, identified as a pure cultural relic of Buddhism village of Vietnam. Being a long ancient village, Ho Khau has 5 generation, is still full preserved worship hall, descendants still happy crowded.